Jesse's dad was very handy with his hands. He could build practically anything. One day he built a digidometer, which helped Jesse with his homework. Another time his dad built a pickleodon, to help Jesse's mom open jars of pickles. Jesse's dad had been spending a lot of time in the garage with the door locked. He wouldn't let Jesse or his mom in to see what he was doing. Jesse tried peeking through the key hole, but his dad had put tape over it. "I wonder what my dad is building in there." A few days later Jesse's dad opened the garage door. "Jesse, you and your mom can come and see what I've done." They both ran into the garage. "Wow! It's a spaceship. Does it work?" Jesse ran his hands over the green paint and the glass dome. "Of course it works, Jesse. I'm going to take a flight in it. If it works all right, then I'll take you both for a ride." Jesse's dad put on a special pink and green suit he'd made. He climbed into the spaceship and turned it on. Vroom. Vroom. He flew out of the garage and straight up into the sky. "Wow! Look at Dad go!" 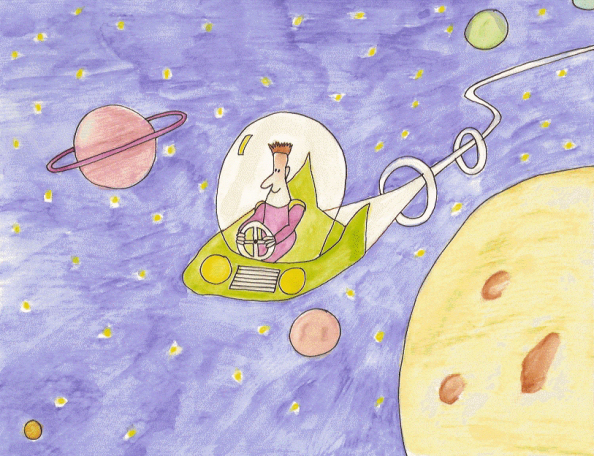 The spaceship flew past Mars and Venus and Saturn and through stars and past comets. When Jesse's dad landed, he opened the lid. "It worked and it was fun. Climb in Jesse and you too," he said to his wife. They flew up into the sky and through the stars. Jesse was so excited. He saw the rings of Saturn and the moons of Neptune and even got to see Pluto. Zoom. Zoom. Zoom. They flew across the heavens. When they returned to Earth, they flew back into Jesse's garage. "Now what should I invent," Jesse's dad said. "How about a googimometerscope, for the space ship," Jesse said. Jesse and his mom went back inside and heard him making all sorts of noises. "Dad is cool, isn't he, Mom." "He sure is," she said.